baby walker activity toy fisher price zebra walker. Used but in really good condition. I've already disassembled it. Ready to post. From pets and smoke free home. Please check out my other items. Enjoy the bidding. Fisher-Price Stroll-Along Musical Walker. Condition is Used. Dispatched with Royal Mail 2nd Class. When your little one is ready for walking, the fisher-price princess mommy stroll-along musical walker is ready to provide the steady support she needs. A press of the magic wand button rewards baby with fun sounds. Fisher-Price Stroll-Along Musical Walker. Condition is Used. Collection in person only. Fisher Price Zebra Baby Walker. Condition is Used. Paypal or cash accepted. Fisher Price Mommy Stroll Along Musical Princess Walker. As little ones grow and go, Sis will introduce them to the alphabet, shapes, colors, counting, and even Spanish words! Let's go for a stroll, baby! Contains : Fisher Price Sis Walker. Fisher Price. Academics: Playful songs and phrases introduce your baby to the alphabet, colors, numbers, Spanish words, and more! Fisher price stroll along musical walker. Used but in excellent condition. In original box ready to ship. From a smoke free pet free home Any questions please ask. FISHER PRICE PEEK A BLOCKS GOBBLE AND GO HIPPO WALKER AND RIDE ON WITH BLOCKS. Your baby will have hours of fun gobbling up Fisher-Price Peek-a-Blocks with this adorable hippo walker that converts to a ride-on as baby grows. When your little one is ready to take her doll for a walk, the Mommy Stroll-Along Musical Walker is there to provide the steady support she needs. Hands-on activities include beads and flip book to help develop fine motor skills. TheFisher-Price Zebra Walker is the kind of first friend you want for your little one! This zebra's full of busy, hands-on activities for sitting babies. Your baby can turn the book page or press the light-up buttons to hear all about ABC's & 123's through sing-along songs and phrases with new animal friends! Fisher Price Stroller. Adorable stroller styling encourages early role play and nurturing. A press of the “magic” wand button rewards baby with fun sounds. The clacker beads and butterfly flip book help foster fine motor skills, too. Baby musical push alone walker . Used. In good condition. Dispatched with eBay delivery – Shutl 2-3 days. This walker features two modes from which parents can choose: walker or toy. Fisher Price is well known for its great products, a lways eductaional and inspiring. This is the ideal toy for young kids just starting to walk. When your little one is ready to take her doll for a walk, the Mommy Stroll-Along Musical Walker is there to provide the steady support she needs. For ages 9 months and over. Batteries required: 3 x AA (not included) plus. Fisher-Price Stroll-Along Musical Walker. Condition is New. Collection in person only. By: Fisher Price | sku: DLF00. This zebra’s full of busy, hands-on activities for sitting babies. Your baby can turn the book page or press the light-up buttons to hear all about ABC’s & 123’s through sing-along songs and phrases with new animal friends! This zebra's full of busy, hands-on activities for sitting babies. Your baby can turn the book page or press the light-up buttons to hear all about ABC's & 123's through sing-along songs and phrases with new animal friends! Activities include flipping doors, sliding beads, turning gears, and spinning panels. In the center is a ball that spin. Walker folds for portability and storage. Baby walker features: Size H35, W48, D16cm. Fisher-Price Stroll-Along Musical Walker. PICK UP ONLY TW12. baby learn to walk Zebra Fisherprice. Condition is New. Collection in person only. As little ones grow and go, Puppy will introduce them to the alphabet, shapes, colors, counting, and even Spanish words! Contains : Fisher Price Puppy Walker. Fisher Price. Let's go for a stroll, baby! Fisher Price Musical Walker. Excellent condition. Volume control. Motion activated option. Smoke and pet free home. Let's go for a stroll, baby! As little ones grow and go, Puppy will introduce them to the alphabet, shapes, colours, counting, and even Spanish words! Gross Motor: Little muscles get a big workout as sitting little ones reach for and interact with the activities and then pull up to stand and walk behind the walker. This sturdy pony is ready to roll, entertaining its rider with lively. Press pony's cheek for music & sounds. Roomy basket—for a sweet doll! Comfy, contoured seat and musical fun as she rides along! When your little one is ready to take her doll for a walk, the Mommy Stroll-Along Musical Walker is there to provide the steady support she needs. Colour Pink. Size H40.5, W48.5, D14cm. Size H40.5, W48.5, D14cm. By: Fisher Price | sku: CGN65. Adorable stroller styling encourages early role play and nurturing. When your little one is ready for walking, the Fisher-Price® Princess Mommy Stroll-Along Musical Walker is ready to provide the steady support she needs! Fisher-Price CHM91 Roaring Rainforest Jumperoo, New-Born Baby Activity Centre with Music and Lights. Fisher-Price Roaring Rainforest Jumperoo is a baby activity centre for babies (weighing under 11.3 kg). · Adorable stroller styling encouragesearly role play and nurturing. 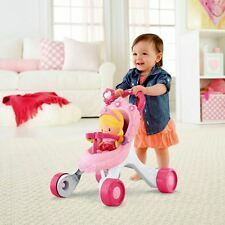 Fisher-Price PrincessMommy Stroll-Along Musical Walker, Baby Walker with Activities, Music andSounds. · Baby's rewarded with fun songs andsounds when she presses the magic wand - a first introduction to cause andeffect. FISHER PRICE BABYS FIRST FIDGET CUBE. With six sides of unique fine motor skill-boosting play and a variety of colours and textures, this activity block will keep your little one busy as a bee! Fisher Price Learn With Me Zebra Baby Walker Educational Toy W/ Music And Sound. Like new, some scuff mark on the wheels. Dispatched with Other Courier (3 to 5 days). Fisher Price, Princess Stroll-Along Musical Walker. Princess Doll included - immaculate. - Baby’s rewarded with fun songs and sounds when she bats at the “magic” wand, a great first introduction to cause and effect! Fisher Price wording is scratched on handle, see pictures . Musical bear. Fisher-Price Dolls Pram Stroll-Along Musical Walker Kids Toy Sit Play Stand Walk. Condition is Used. Also ride on matching toy. Both never played with. Collection only. Mattel Fisher-Price K9875 Activity Walker Baby First Steps .